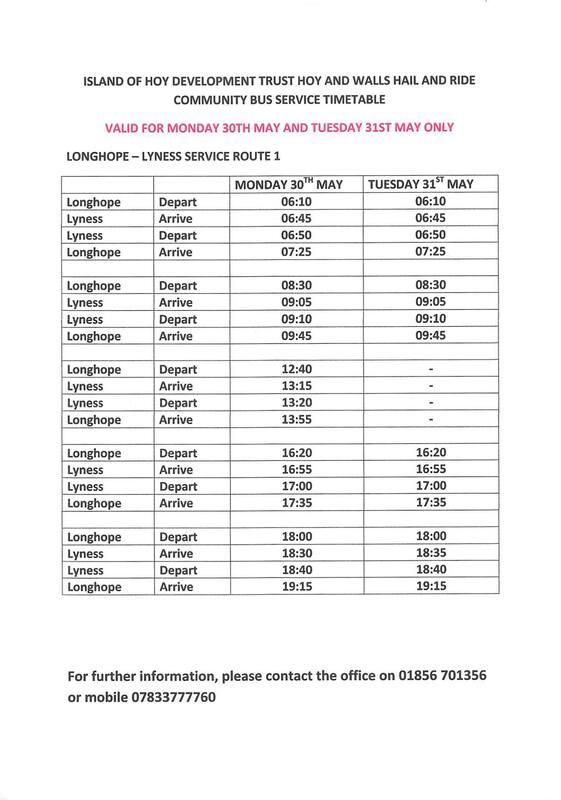 Please click HERE for the community bus timetables. A day’s notice is required for the carriage of non-collapsible wheelchairs. Is there Community Bus service between Moaness Pier and Rackwick? Alternatively, is there a route map of Route 2 (Moaness-Longhope), so I can see where and when it stops? Thank you! The community bus doesn’t run a service to Rackwick. The route to Longhope goes passed the turnoff to Rackwick. The drivers will drop you off wherever you want along the route. Route 2 is only operated on Wednesdays and Sundays. Hi, I will be coming by ferry to Moaness and want to walk to Rackwick and then the Old Man of Hoy – how long will that take me (I am not a very fast walker) as I will have to walk back as well and don’t know if I could make it to the ferry in time??? Please check out these websites for details of the walks from Moaness to Rackwick and Rackwick to the Old Man. There is a minibus from Moaness to Rackness ‘during the summer months’. Does this run in September? The minibus service from Moaness to Reckness should be booked in advance as recommended on this website. Is there a name and a phone number of this minibus service to call it in advance? contact one of the following private taxi/tour companies. Has there been any alterations to timetable for tying in with altered boat times on 30th/31st May (Battle of Jutland centenary) and is there a downloadable version if so. An updated timetable for 30th/31st May 2016 can be found on The island of Hoy Development Trust facebook page. I write from Spain. Next 8 september we are planing to go to the old man of hoy. We will arrive to Moaness at 16:30. Have you got 2 places in the bus to pick us yo radwick and get back to Moaness the same day? Hello, I was wondering if there’s an updated timetable for April 2018? We are looking to come across with our wee dog and would be looking for transport from Moaness to Rackwick to walk up to see the Old Man of Hoy. Look forward to hearing from you. 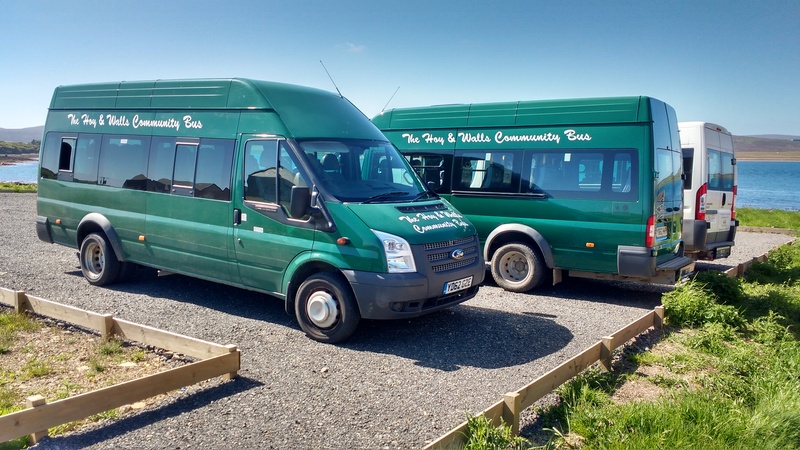 Hi, the timetable on the website is still correct for April 2018, however the community bus service doesn’t run to Rackwick. There is private hire available from Moaness to Rackwick with Albert Clark on 01856 791315. Just to say an enormous thank you to George and Dougie (plus Erin) for looking after my parents and me last week, when we chose to visit Hoy on the day that everything was shut! My mother is still talking about her tour of the island, the people she met on the bus and the information about her parents’ life on the island in 1939-40 that she gleaned from our visit last week. George – please thank the delightful couple of the hotel where they titlist gave us delicious cake and coffee even though they were shut! Dougie – if you have any more information about the first German prisoner of WWII, whom I am pretty sure my grandfather had charge of at some point, we’d love to hear it! My mother has also asked if you could also thank the Harbourmaster for suggesting that we travelled on your bus – together you and your passengers were far, far better than any organised tour or museum display!